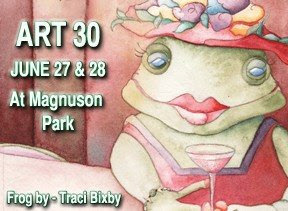 The ART 30 art fair, organized by the Northwest Art Alliance, was held at Magnuson Park in Seattle Washington on June 27th and 28th! Friends of FSH Research was welcomed as this year's community partner for this art show. As the ART 30 partner, we were able to talk to the artists about our organization and our charity auction which will be held on January 30th. The generosity of the artists was amazing!!! We received many wonderful art pieces which will be sold at our auction to benefit FSHD research. Please check out our website (www.fshfriends.org) for the complete list of the donating artists.